Students gathered in front of Rosenwald Hall on Friday afternoon, demanding the disarmament of the UCPD, the divestment from the university’s private police force, and more funding to be dedicated to mental health resources on campus. The University of Chicago had failed fourth-year Charles Thomas before he was shot by a University of Chicago Police Department (UCPD) officer Tuesday night, activists say. “Rather than being provided with a regular counselor on campus, SCS referred Charles off campus,” Lastres said. There is a history of bipolar disorder in his family, his mother said, though she has not seen signs in Thomas. Protesters march from Rosenwald to Levi Hall. Lastres also detailed Thomas’s injuries from the bullet, which punctured his shoulder. “Suffering a broken shoulder blade and a collapsed lung, Charles was taken to Northwestern Memorial Hospital, where as of last night he remained chained to his hospital bed and under guard by a private University of Chicago police officer with extremely limited access to his family and no access to his friends,” he said. A University spokesperson said he could not comment on Thomas’ medical condition, due to federal privacy standards set by the Health Insurance Portability and Accountability Act (HIPAA). A spokesperson had previously said that room access was limited because Thomas was in police custody. The University provides walk-in counseling services without a waitlist, to students who urgently need to meet with a counselor, through access to a Crisis Intervention Counselor, according to a spokesperson. After regular hours, students have access via phone to a Therapist On-Call. 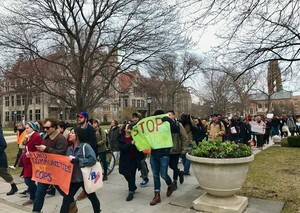 The Friday protest was organized by UChicago United, a coalition of multicultural student organizations, students, campus and community groups, and faculty. Activists marched from Rosenwald to Levi Hall to deliver a list of demands to University President Robert J. Zimmer and Provost Daniel Diermeier. Protesters chanted: “How do you spell racist? U-C-P-D. How do you spell ableist? U-C-P-D.” Thomas is part black and part Japanese. Student protesters hold signs reading "Transparency Now," "Disarm UCPD," and "Who do you serve? Who do you protect?" 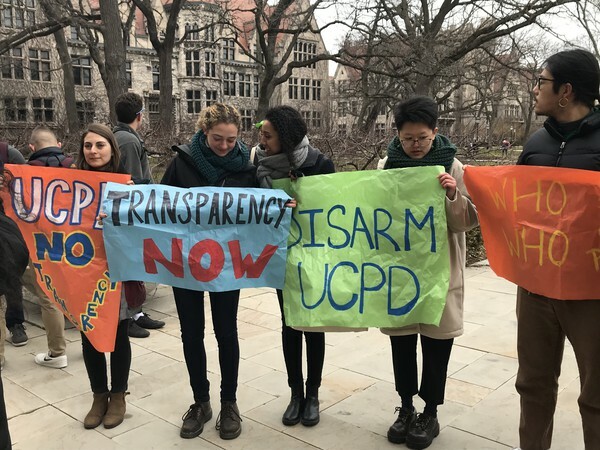 The group issued several demands via an open letter to Zimmer before the event, including the disarmament of the UCPD, reducing the jurisdiction of UCPD’s patrol, increased access to mental health services for students, and increased oversight of the private police force. “We demand community control over UCPD. This shall include an all-elected Independent Review Committee with decision-making powers. No more Board of Trustees control of UCPD!” the letter reads. The full list of demands can be viewed here. The University has emphasized that 85 percent of officers in the UCPD have received 40 hours of crisis intervention training, including the officer involved in the incident. The University aims to have all officers undergo the same training. "That officer [who shot Thomas] had 8 additional hours of training in mental health first aid, a nationally recognized certification intended to help individuals recognize signs of mental health distress and respond appropriately,” a University spokesperson said. The University has not released the name of the UCPD officer who shot Thomas on Tuesday. Other campus groups present at the protest included representatives from Graduate Students United, MEChA UChicago, UChicago Student Action, Reparations at UChicago Working Group, and Students Working Against Prisons. Several community groups, including the South Side Obama Library Community Benefits Agreement Coalition, the Trauma Care Coalition, and Assata’s Daughters, also attended. 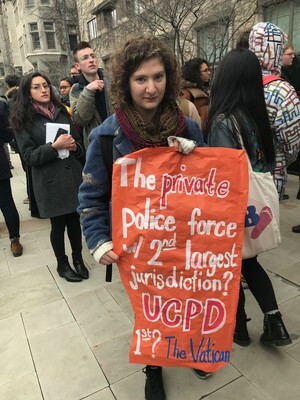 Fourth-year Maya Shaked protests the shooting of Charles Thomas, holding a sign that reads: "The private police force w/ 2nd largest jurisdiction? UCPD. 1st? The Vatican." Protesters are calling for a smaller jurisdiction of patrol for UCPD. Citing Lastres’s statement that Thomas was referred away from SCS, Gindler said the experience “resonated” with her, as she was personally affected by a similar incident. Anjali Dhillon, who spoke at the event on behalf of Fair Budget UChicago and UChicago Student Action, said she sees Thomas’s shooting as part of a broader pattern of unaccountable policing. “The UCPD is unaccountable to the community that it’s policing. It’s clear that this sort of power imbalance needs to change and shift back to the people,” she told The Maroon. Beyond protesting, students aiming to help Thomas have already raised over $15,000 in a fundraiser for medical costs associated with the incident. Editor’s Note: Anjali Dhillon previously worked as a News Editor at The Maroon.